Paramārtha (Sanskrit: परमार्थ Paramārtha; traditional Chinese: 真諦; simplified Chinese: 真谛; pinyin: Zhēndì) (499-569 CE) was an Indian monk from Ujjain in central India, who is best known for his prolific Chinese translations which include Vasubandhu's Abhidharmakośa. Paramārtha is considered one of the greatest translators of sutras in Chinese Buddhism, along with Kumārajīva and Xuanzang. Paramārtha was born in 499 CE in the autonomous kingdom of Malwa in central India, at the end of the Gupta Dynasty. His given name was Kulanātha, meaning "savior of the family", and his parents were Brahmins belonging to the Bhāradvāja clan. His Buddhist name of Paramārtha means "the ultimate meaning," parama: uppermost, artha: meaning. In the Buddhist context, this refers to the absolute, as opposed to merely conventional truth. Paramārtha became a Buddhist monk in India and received support from royalty for his travels to spread the teachings of Buddhism. He most likely received royal patronage from Bālāditya II or Kumāragupta III. The Maukhari ruler Dhruvasena I may have also supported Paramārtha, as his kingdom was a well-known bastion of the type of Yogācāra teachings advocated by Paramārtha. During the Ta-t'ung period the emperor sent a rear guard Chang Szu to Funan to send back to China eminent monks and Mahayana sastras and sutras of various kinds. This country [Funan] then yielded in turning over the western Indian Dharma Master from Ujjain, namely Paramartha, who in Liang was called Chen-ti, and many sutras and sastras in order to honor the emperor. After Dharma Master Paramartha had traveled to many kingdoms he had settled in Funan. His manner was lively and intelligent and he relished details in scriptural texts and profound texts, all of which he had studied. In the first year of T'ai-ch'ing (547) he went to the capital and had a visit with the emperor who himself bowed down to him in the Jeweled Cloud quarters of the palace in reverence to him, wishing for him to translate sutras and sastras. In China, Paramārtha worked with a translation team of twenty accomplished monks. 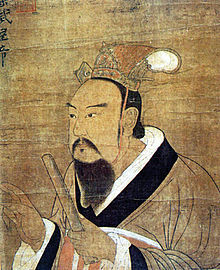 Paramartha's work was interrupted by political events and the general chaotic state of China during this period, which included the murder of Emperor Wu. Several years later, Paramārtha was able to continue translation efforts in earnest with his translation team, beginning with the Golden Light Sutra (Skt. Suvarṇaprabhāsa Sūtra). During much of his later life, Paramārtha continued a pattern of continually translating texts while traveling from region to region in China. He also continued to review his older translations for any areas in which the words and the general meaning were in conflict. By 563 CE, Paramartha had won prominence throughout southern China and had acquired a supportive following of disciples, many of whom traveled great distance to hear his teachings, especially those from the Mahāyāna Saṃgraha. Despite his success in China, Paramārtha wished to return to India toward the end of his life, but felt that this journey back to the west would be "impossible." Instead, he accepted the patronage of Ouyang Ho and continued his translation efforts at a rapid pace. In 569 CE, at the age of 70, he died, and a stūpa was built in his honor. ^ Paul 1984, p. 14. ^ Paul 1984, p. 22. ^ a b c Paul 1984, p. 15. ^ a b Paul 1984, p. 23. ^ Paul 1984, p. 25. ^ a b Paul 1984, p. 27. ^ Paul 1984, pp. 32-33. ^ a b Paul 1984, p. 33. ^ Paul 1984, p. 35. Radich, Michael (2008). "The Doctrine of Amalavijñāna in Paramārtha (499-569), and Later Authors to Approximately 800 C.E. ", Zinbun 41, 45-174.